This review first appeared in the October 1, 1994 issue of the North County Blade-Citizen (now North County Times). 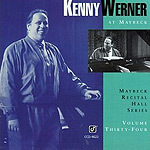 The 34th in a series of solo piano concerts recorded at the Maybeck Recital Hall in Berkeley, Kenny Werner's new CD is a sliceo of jazz magic. The Maybeck Hall is a private facility, now opened occasionally for public performances. Other pianists who have recorded here for Concord include San Diego's own Mike Wofford and Bill Mays, plus other heavyweights like Richie Beirach, Hank Jones, Kenny Barron, Cedar Walton and Marian McPartland. The combination of an almost acoustically perfect setting, an intimate setting (35 people attended the recording session), obviously knowledgeable audience, and the solo setting makes this an intriguing set-up. It's introspective, but the presence of the audience keeps Werner from getting too cerebral or technical. Werner gives standards like "Someday My Prince Will Come," Johnny Mercer's "Autumn Leaves" and Thad Jones' "A Child is Born" lengthy readings. This plays to his strength as a jazz interpreter, as he comes up with variations on a song's theme, reworking it, interpolating it, twisting it around to something new and then bringing it back home again. His recital is emotive and warm, with a relaxed confidence that seems perfectly at home at Maybeck.